Guard 'n' Aid for Thrip is an effective 100% solution which should be diluted with water and applied to your plants as a foliar spray. Thrip treatment should be used as a preventative measure where possible to assist or control the attack of Thrips which can damage if not kill your plant. A little bit about thrips. Thrips are very small extremely active bugs which damage the plants by sucking juices and scraping the plants surface of leaves and flowers. Thrips feed in large groups and leap or fly away when disturbed. Thrips do not need a male to reproduce; Females deposit eggs in tissues of leaves, stem and flowers. Each female can produce up to 80 eggs! Depending on weather conditions eggs will hatch at different rates, warm environment eggs will hatch within days, cold conditions can take weeks. As wingless immature Thrips they feed off plant sap then after weeks of going through the growth cycle Thrips can drop to soil level to pupate, rising adults fly to repeat the cycle. From egg to adult the process can take as less as 16 days in warm weather. How to identify... Your plant may begin to have patches of white pale areas, blotchy, leaves may begin to wilt then eventually die. To avoid plants dying strict maintenance is required, remove dead plant matter from your grow room to reduce active places for thrips to breed. It is important to act straight away with Thrip attacks as they breed very fast, inspect plants carefully looking for damage areas Thrips can get in to lay their eggs. 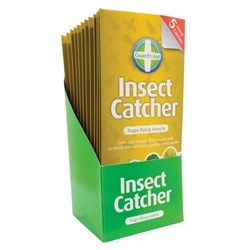 We recommend Blue sticky traps to help deal with the attack alongside our pest control product. 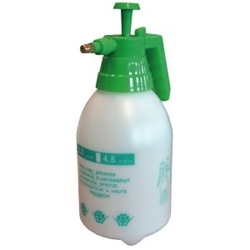 Guard 'n' Aid for Thrip should be used 15ml to 1 litre of water. Make sure the solution mixes properly and apply spray with lights out. 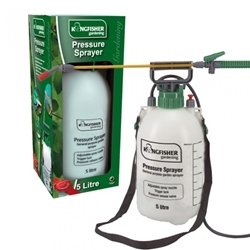 Kingfisher Quality Pressure sprayer available in 5L version for effective powerful foliar spray. 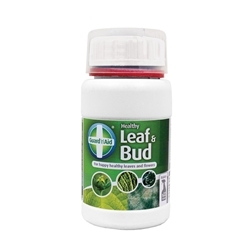 Healthy Leaf and Bud is used to prevent bud rot and plant wilting.